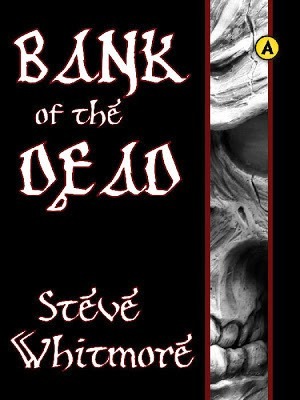 Steve Whitmore, Bank of the Dead. Abysswinksback Books, 2013. Pp. 24. ASIN B00HDOD7VK. $1.27. Whitmore is a funny man. No, really, he is. Funny that is daft, yet surprisingly literate at the same time. Specialising in the lightest, shallowest of nonsense stuff, he prefers his fantasies to take a large dollop of comic-book caper, mash it up with semi-mythological tropes and serve on a bed of contemporary contiguousness, sprinkled with a garnish of outrageous wordage. This time he is taking a swipe at banks, greed, and the power of the people. Well, the dead ones, anyway. Times are tough in the world of the dead: the imposing Raiders-of-the-lost-Ark-pre-credits-sequence-that-bit-in-the-jungle-with-the-temple-esque repository of Haunting Benefit vapours is making cuts to payments of vapours to the dead and ghoulish. Without the vapours, ghosts cease to have effect in the living world, and beasties of all kinds cease to be scary. It’s a big deal to the dead: an eternity, instead, of going ever crazier, unable to make any contact with the world they are otherwise trapped in. For Sir Edward, the incumbent spectral presence at his familial manor, it is a double blow: his hauntings being the only thing keeping the old place going (in the face of stiff competition from a farming theme park next door). Faced with bureaucracy’s cold refusal and unsympathetic ear to his plight, he makes a vow, spurred on by the derision of his fellows, to break into the bank (high above the Earth on a splinter of asteroid) and release vaporous funds—for the good of all spooks everywhere. Power to the people! Down with The Man! Sir Edward will have to face the guardian horrors of the bank, including a hell-hound, a Man-Fish (guest-starring, one feels, from Hellboy) and face down the cackling, sorcerous head banker (so that’s where Emperor Palpatine went when Darth Vadar threw him down) who has plans for Grand Theft Undead and a nice retirement pad from the proceeds. Obviously, Whitmore has picked a good theme for the current financial climate of deep suspicion regarding the world of banks and bankers… And that is about as ‘right on’ and critically relevant as Whitmore gets; this is enthusiastic, purposefully OTT fluff on a bold and highly entertaining scale. And Whitmore never pretends to anything else; credit to him for creating a fun slice of action without weighing it portentously downward with too much practical sensibleness. It is interesting to note that something that is primarily fashioned from a melange of influences and pop culture references, to produce a proper mini-adventure. With contextually believable characters sufficiently human in their behaviours so as not to utterly alienate, and with nods to ‘real life’ perspectives, Whitmore has made a story that bounces along feeling considerably more vivid in the thoughts and ideas it raises than ‘serious’ speculative fiction. Possibly it is the wheel-greasing effect of humour, using as he does both deadpan and slapstick. Possibly it is the outrageous assumption of a new reality that can contain the supernatural speculations he has made, which sweeps up the reader with no time for shilly-shallying, but it carries proof that even light-hearted nonsense is very effective in progressing a voice, of carrying a theme. It feels as if the more artificial ‘nonchalance’ of modern media, especially that which arrives piece-meal into the psyche; e.g. social media, graphics-heavy advertising and reporting—the Internet as a whole is one grand collection of multi-form data—is but a throw-away second-best to crafted hokum that has a single, intelligent wit behind it. Through stories like Whitmore’s, we are reminded of the very real power of comedy as a basis for stimulating commentary, by being itself stimulating and subversive. Whitmore’s style (and one unconsciously emulated by this review, now I look back) relies utterly on words. He never uses a simpler phrase where a thesaurus-rifling conflagration will do. It may mean that some passages need re-reading in a calmer light in order to make some clear sense of it, but it is also, for those brave enough to plunge on in, like taking a leap into a calorific, toffee pudding of a story. Rich, occasionally sticky, and requiring thoughtful chewing-over, the biggest joke—the best play—is the use of such overbearing fecundity of language. This is not for the faint-hearted, though: it is easy to get lost in Whitmore’s extended sentences. Whitmore himself has reached a happy medium with his badinage; any more and he is in danger of losing the fission it applies to his stories, and the patience of most readers! Here here. Thanks for a generous review. Just seen some errant pricing on this one. According to my Amazon page, this should be 99c/75p — but it isn't. While I sort this out, I'm throwing it up for FREE c/o KDP Select, so if anyone is interested in reading, it should be available for zilch some time on Saturday till some time on Sunday.